Bagana (Papua New Guinea). On 2 and 4 May ash plumes rose to 2.4-3 km a.s.l. and drifted 45-55 km NE. Fernandina (Galapagos Islands). News reports say that the eruption that began on 10-11 April continued for 20 days and included steam-and-gas emissions and lava flows. Galeras (Colombia). An eruption occurred on 29 April, an ash plume drifted NW and ash fell in areas up to 35 km distant. Ash plumes drifted NE over 4-5 May and ashfall was reported Pasto. Krakatau (Indonesia). The significant rise in the number of eruptions from Anak Krakatau that began in March continued. On 24, 25 and 29 April visual observations identified the source of the eruptions as a crater on the W slope of the volcano. Ash plumes mainly drifted E and ashfall occurred up to 5 km from the crater. Emissions were seen rising to 500 m above the crater on 5 May. Reventador (Ecuador). A thermal anomaly and a possible low-level plume drifting W at Reventador were detected on 1 May, and lava and gas emissions with little to no ash were reported, with possible smoke from burning vegetation. Rinjani (Lombok Island, Indonesia). The eruptive activity continued, with increased seismicity and tremor detected during 29 April-2 May, and on 2 May an eruption from Barujari cone made a ‘booming noise’ and produced dense brown emissions to 1 km. On 4 May an eruption of ash produced a white to brown plume to 500-700 m above the cone and drifted N.
Shiveluch (Kamchatka, Russia). Over 28 April to 1 May, seismic activity was above background levels, and ash plumes probably rose to 5-6 km a.s.l., and active fumaroles were reported on 29-30 April. Hot avalanches produced plumes to 6 km a.s.l. and drifted SE. An intense daily thermal anomaly was detected. On 5 May an eruption was reported to have produced a plume to 6.7 km a.s.l. Slamet (Java, Indonesia). Over 23 April-5 May elevated seismicity and eruptive activity from the western part of the crater continued, with reports of incandescent lava ejected 25-100 m above the crater and grey and white emissions rising 100-800 m above the crater. Asama (Japan). On 30 April and 2 May eruptions reportedly produced plumes to 3-3.4 km a.s.l. and drifted NE. Batu Tara (Komba Island, Indonesia). Over 29-30 April and 3-4 May ash plumes rose to 2.4-3 km a.s.l. and drifted 45-185 km NW and W.
Chaitén (Chile). On 29 April an ash plume from the dome complex rose to 2.1 km a.s.l. and drifted NW. Cleveland (Alaska, USA). No volcanic activity has been reported since late January so the alert level has been lowered to ‘unassigned’. Dukono (Halmahera, Indonesia). Ash plumes from Dukono rose to 3.7-4.5 km a.s.l. and drifted 45-165 km E and NE during 29 April-4 May. Ebeko (Paramushir Island, Russia). Over 24 April to 1 May eruptive activity continued, with gas-and-steam plumes with some ash content rising to 3.5 km a.s.l. and drifting 6 km ‘in multiple directions’ and small ashfall in Severo-Kurilsk, 7 km to the E, on 23 April. On 30 April an ash plume was reported to 1.8 km a.s.l. and drifting 20 km E.
Karymsky (Kamchatka, Russia). On 26 April a weak thermal anomaly was detected. Kilauea (Hawaii, USA). Lava flowed SE through a lava tube system to the Waikupanaha (where some explosions occurred) and Kupapa’u ocean entries. The Halema’uma’u crater vent continued to produce a white plume. ‘Unusually bright incandescence’ was seen from the vent on 3 May, accompanied by a decrease in summit tremor levels; bright incandescence was also noted on 4 and 5 May. Popocatépetl (Mexico). Over 29 April to 5 May emissions of steam and gas with slight ash content were observed. Rabaul (Papua New Guinea). White and occasionally grey plumes from Tavurvur cone rose 0.5-1 km above the crater on 27 April and ashfall was reported in Kokopo, about 20 km SE, Activity decreased over 28 April-2 May. Ash plumes rose to 2.4 km a.s.l. and drifted about 35 km NE over 3-4 May. thousand feet’ above the summit and drifted SE. Sakura-jima (Japan). Eruptions over 3-4 May produced plumes to 2.4-3.7 km a.s.l. Suwanose-jima (Japan). Eruptions over 29 April-1 May produced plumes to 1.5-1.8 km a.s.l., drifting W on 30 April and 1 May. Tungurahua (Ecuador). Steam-and-gas plumes were seen ‘almost daily’ over 28 April to 5 May, rising to under 6.8 km a.s.l. and drifting SW and W. Lahars descended to the NW on 28 April and to the W on 1 May. Crater incandescence was seen at night on 30 April, and on 29 April and 2-3 May, noises and explosions were heard. Ashfall was reported to the SW, NW and N on 3 May. 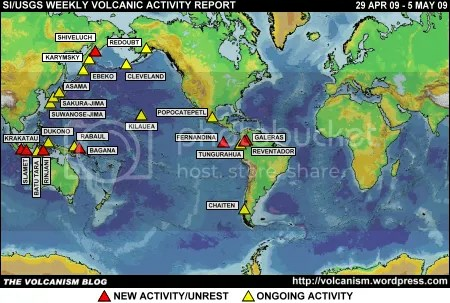 The foregoing is a summary of the Smithsonian Institution/United States Geological Survey Weekly Volcanic Activity Report covering 29 April to 5 May 2009. It is provided for information only, and is based on but not a substitute for the full report, which comes with its own criteria and disclaimers. The map base is derived from the Smithsonian Institution/USGS/US Naval Research Laboratory This Dynamic Planet website.